The FCC posted to the Auction 1001 website the Reverse Auction Initial Commitment User Guide and Online Tutorial. These materials are intended for broadcasters that submitted an FCC Form 177 to participate in the Reverse Auction. March 28, 2016 10am EST – March 29, 2016 6pm EST: The Initial Commitment Window – a total of 32 hours – during which broadcasters must file their Initial Commitments. The Initial Commitment may be changed until the close of the window, but if no commitment is made by the close of the window, the station will be excluded from the auction and repacked in its pre-auction band. March 24, 2016 10am EST – March 28, 2016 9:59am EST: The Initial Commitment Preview Period – a four-day period during which all participating stations are encouraged to log into the system, set their PINs, and view the list of stations and Relinquishment Options available to them. L to R: Chris Warren, Midwestern Broadcasting Company; Congressman John Moolenaar (R-4th); Pete Iacobelli, Heritage Broadcasting; and Kevin Dunaway, Heritage Broadcasting. MAB’s Executive Committee and some Board members traveled to Washington D.C. February 22-24 for the 2016 National Association of Broadcasters State Leadership Conference (NAB SLC). L to R: Ed Fernandez, E.W. 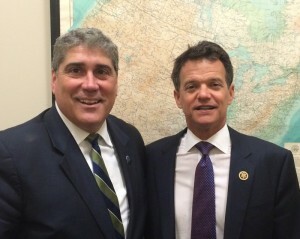 Scripps Television and MAB Board Chairman; Congressman Bishop (R-8th), Peter Tanz, Midwest Communications. The conference agenda included presentations by NAB President/CEO Gordon Smith on what Washington policies have in store for broadcasters and digital media companies in 2016, the importance of using social media as an advocacy tool, and policy updates presentation from the NAB government relations team. 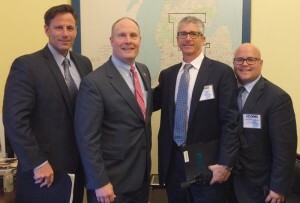 The MAB Executive Committee met with members of Michigan’s Congressional delegation and their telecommunication staff to discuss the need to oversee the FCC as the agency implements incentive spectrum auction procedures set up by Congress. In addition, discussions took place about broadcasters’ opposition to the performance tax and advertising restrictions, preserving the integrity of the free market process in the retransmission negotiations, and reforming media ownership rules to reflect the competitive marketplace. According to a report in FierceWireless, Google said it will not bid for 600 MHz spectrum licenses in the FCC’s upcoming spectrum incentive auction scheduled for March 2016. Google will join Sprint, Charter Communications and other tech heavyweights in sitting out the event. “Like all those interested in improved connectivity and equitable access, we’ll be following the upcoming spectrum auction closely. That said, we have not filed to participate,” a Google representative told Reuters. Google also did not participate in the FCC’s AWS-3 auction a year ago that brought almost $45 billion in total winning bids. The FCC has submitted its budget request for fiscal year 2017 to Congress, asking for $358,286,000 in budget authority from regulatory fee collections, a decrease of 6.7% from FY 2016. The request includes over $44 million earmarked for the Commission’s move or renovation of existing space. The new proposal asks for an installment of $17 million for the same purpose. That is the second portion of a total $44 million ‘ask’ made last year for the move. The FCC anticipates that the General Services Administration will award the contract for the move or space reconfiguration this spring. The agency tells Congress that the new contract will use space more efficiently, reduce the FCC’s footprint, and save up to $119 million over 15 years through reduced rental costs. According to CommLawBlog, the FCC’s Incentive Auction Task Force has sent ‘First Confidential Status Letters’ (First CSL) to would-be reverse auction applicants advising them of potentially fatal incompleteness flaws in their application. According to the Task Force’s public notice, the First CSL includes “information on the status of [the addressee’s] application, as well as the status of each station that it selected.” These assessments are based on the FCC staff’s initial review of all applications filed last month. The letter confirms that an application is complete, including all information about each station that an applicant has put into the auction. However, it may indicate that either the application, or the showing relative to one or more specific stations, is lacking. Deadline for corrections is February 26 at 6 p.m. (EST) to fix whatever problems there might be with the application. Senator John Thune (R-SD), Chair of the Senate Committee on Commerce, Science, and Transportation, released a statement that he and ranking committee member Bill Nelson (D-FL) are planning to introduce a spectrum reform bill later this week, titled ‘The Mobile Now Act,’ with the goal of improving wireless access. However, Thune’s House counterpart, House Energy and Commerce Committee Chair Fred Upton (R-MI), stated that his committee will monitor the upcoming spectrum auction before taking action on any spectrum reform legislation. MAB is tracking. According to the Broadcast Law Blog, the FCC announced that all Form 398 Quarterly Children’s Television reports must be filed in the new Licensing and Management System (LMS) starting March 31. The FCC is migrating all TV broadcast filings to this new system, and the next Form 398, due by April 10, must be filed in this system. While LMS has been available for stations to use for these reports since last June, beginning with the reports due in April, no more reports can be filed in the FCC’s old KidVid Filing System. Children’s Television reports need to be maintained in the public file for the entire license term and only removed from the file after the next license renewal is granted. The FCC’s AM revitalization rules have been published in the Federal Register on January 19. The publication sets the effective date of the new rules as February 18, and establishes the framework for the one-time FM translators-for-AM stations filing windows in 2017, the continuation of “MATTOON Waivers” and the 250-mile window for moving existing translators for use as AM simulcasters. The new rules also modify the community coverage requirement for existing AM stations to reduce required coverage to 50% of the area or 50% of the population of the community, delete the Ratchet Rule, and adopt new rules for Modulation Dependent Carrier Level control of transmitters.